Margaret Blank: Thoughts from a Textile Artist: Back to "Werk"
cut up some more ties and make corresponding crazy quilt blocks for five more Tuesday stitches (thank you, Sharon B, for a week off!). This morning, though, I began to work out what was going to be my Assessment piece for Module 6 of the City and Guilds -- till Memories of Mirror supplanted it, of course. This is a rough sketch/mock-up of All the Streets End in Trees, featuring piecing (as Module 6 required) and some applique. 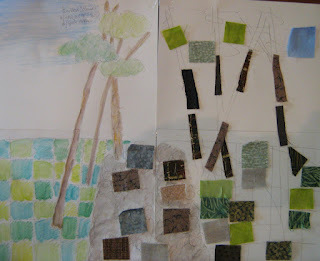 I sketched with water-colour pencils, and then cut up some fabric samples for grass, road, trees, and sky.